Danny Lipford in front of the renovated Kuppersmith Project house. Spring has arrived and summer isn’t far behind, making this the ideal time to enhance the outdoor living space on your home! One of my goals in the extensive renovation of the historic Kuppersmith Project house was to create the ultimate, low maintenance, backyard retreat that could accommodate everything from a relaxing family cookout to formal outdoor entertaining. Kuppersmith house family room looking out through glass doors to porch. To turn my dream of creating the perfect backyard retreat into reality, I added a spacious 12’ x 21’ back porch to the house, which is accessible from the family room, kitchen, and master bedroom. 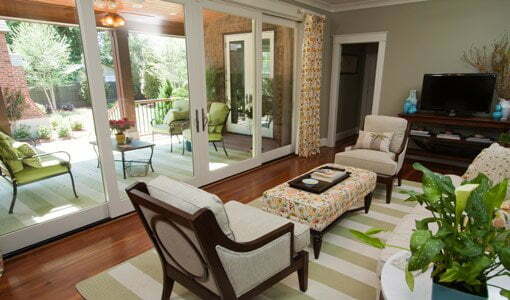 Massive 8’ x 16’ sliding glass patio doors from JELD-WEN Windows & Doors in the family room allow an unrestricted view of the porch and backyard beyond. Double glass doors on both the kitchen and master bedroom add to the openness of the house and help bring the outside in. Back porch on Kuppersmith house with composite decking and railings. The first thing to grab your eye when you step through the sliding glass doors from the family room onto the back porch, is the rich Ipe look of the Fiberon Horizon composite decking. Composite decking is a low maintenance alternative to wood decking that resists fading, scratching, staining, or splintering. 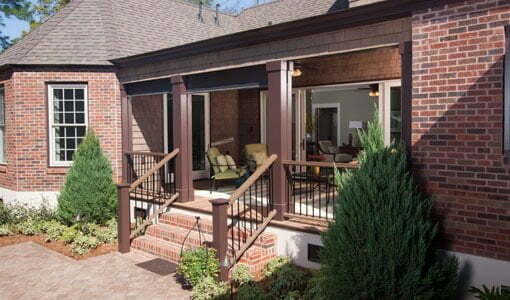 Fiberon decking comes with a 25-year warranty against staining and fading. Since our deck was attached using special hidden fasteners, there are no screws or nails visible to mar the sleek, smooth appearance. I also installed low maintenance Fiberon Horizon Plus composite railings between the columns on the porch and down the steps to the patio. 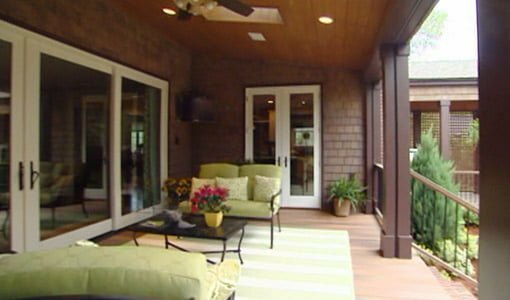 Retractable motorized screens on the Kuppersmith house porch. To extend the usability of the porch and keep annoying insects at bay, I installed motorized retractable Executive Screens from Phantom Screens. When raised, the screens are hidden from sight on rollers mounted inside the soffit on the porch. Tracks cut in the columns allow the screens to be raised and lowered at the touch of a button. Phantom Executive Screens can be made to cover openings as small as 27” to as large as 25’ wide by 16’ high. The special solar mesh fabric used for the retractable screens blocks 90% of the sun’s heat as well as harmful UV rays. This reduction in solar heat gain allows the glass doors on the family room to be opened to the outside when the screens are lowered, turning the porch into additional living space for the home. Skylights—mounted in the V-groove, solid cypress porch ceiling—add more natural light to the porch. The skylights can be opened by remote control and are screened to provide additional air circulation on the porch. Back porch and paver patio on Kuppersmith Project house. Brick steps from the back porch lead to a beautiful paver patio, laid with an intricate diagonal pattern, that’s perfect for outdoor entertaining. A built-in brick grilling station with stainless steel gas grill is conveniently located under the covered breezeway next to the kitchen door. Off the open patio, the manicured lawn in the backyard is enclosed with low maintenance Fiberon composite fencing. The area between the fence and lawn is landscaped with magnolia, river birch, and holly trees, along with numerous shrubs and flowers. Water feature next to composite fencing in backyard of Kuppersmith house. 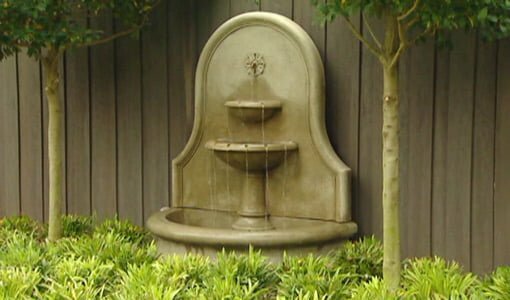 Next to the fence, the soothing trickle of water from a fountain provides an oasis from the hustle and bustle of the world outside our backyard outdoor retreat.